When you want a substantial salad but don’t want a lot of fuss. This recipe for Bacon & Eggs Frise Salad will fill you up and not break the calorie budget! I wasn’t even thinking of a Bacon & Eggs Frise Salad when I was at my local whole foods the other day looking for something to make for dinner. It’s summer, so I want to eat light and not use an oven at all. I love their produce section. It’s colorful and inspiring ……and full of all sorts of inspiration. I’m browsing all the many choices when a lady right next to me asks what the heck is this? She then points to the Frise’ lettuce. We had a 5-minute conversation on Frise’. I felt like I was working for the Frise’ lettuce company. I went on and on about it. How Frise’ looks at the store! Aha, there it is….I know what I’m going to make….. Bacon & Eggs Frise Salad: crispy bacon, poached eggs, homemade croutons with a salad with that beautiful Frise’ that lady pointed out. I serve the Frise’ salad tossed with a tangy vinaigrette dressing, crunchy crumbled bacon and smoky croutons. The ice-cold lettuce with the salty bacon pair nicely with the smoky crouton. Then over the top of the salad is a couple of poached eggs. The warm egg gives a contrast that is just mouth watering. 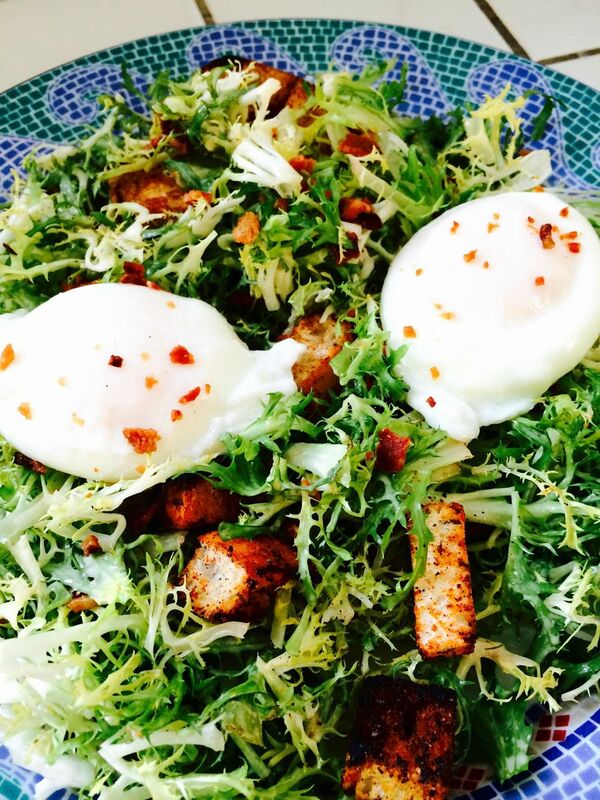 Then when you cut into the poached egg and the yolk oozes out onto everything it makes for one satisfying salad. Looking for other salads? Try my Watermelon Salad or this Potato Salad! Cut well washed lettuce into bite sized pieces, leaving only the woody core when finished. Place into salad bowl and put in refrigerator to keep frise' well chilled. On microwaveable plate fold up paper towels several layers thick. This will serve as a base to cook your bacon on. Place bacon side by side onto paper towels. Cover top of bacon with one last paper towel. Microwave on high until bacon is very crisp. **See cooking note 1""
Let cool, then crumble bacon into bite sized pieces. Heat skillet until hot, then add butter and olive oil. Add bread pieces and toss to coat. Once croutons are all coated sprinkle with paprika, continuing to toss or stir with wooden spoon. Add parsley, salt and pepper to taste before removing from pan. Let cool on a paper towel for at least 5 minutes. These can be made up to a day ahead and stored in an air tight container. In a small bowl mix mustard, vinegar and spices thoroughly. (I use a liquid measuring cup so that its easy to blend. Then slowly add olive oil while stirring rapidly with a fork until well blended. Gently stir water a few times to make sure eggs do not stick to the bottom. Cook eggs in batches until complete. Toss salad with crumbled bacon, croutons and vinaigrette and place on individual serving plates. 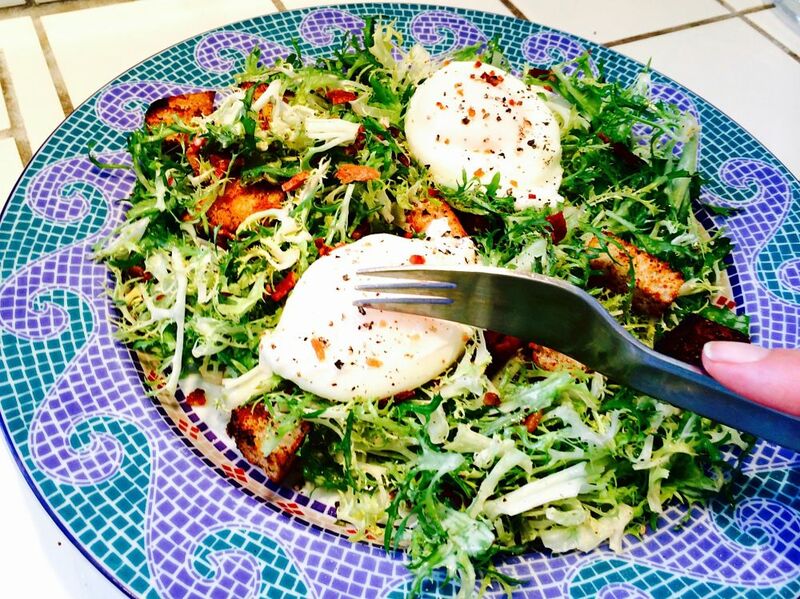 Place poached eggs atop salad. Season generously with pepper before serving. 1. Cooking bacon in microwave on paper towels allows for most of the oil from bacon to be absorbed which allows for less calories in your salad. ** Alternatively you could cook crumbled bacon in a sauté pan making certain to pat out all excess bacon fat once fully cooked. 2. A gentle rolling boil works best, if you have a strong rolling boil, the eggs will cook too fast and get rubbery. 3. I suggest using a stovetop wok pan for making the eggs, but any rounded edge pan will do. The water swirls slowly cooking the eggs in a pan like this, which helps avoid sticking to the bottom when cooking. 4. I cook 2 eggs at time, you could do more depending on the size of your pan, but you need to leave enough room for the eggs to move around while cooking. In doing 2 at a time it also keeps the 3 minute time more accurate for both eggs. This looks so awesome! I’ve never thought about using a different kind of lettuce. I’ll definitely be trying this! Plus bacon is so yummy! Can you believe I didnt eat eggs until a few years ago…. NOW I completely agree with you! Every. Single. Time.! The salad looks great, but I think the real MVP might be those smoky croutons! I love the benefits of eggs, but I just don’t like the taste…I’m working on that because your salad good good. This salad is right up my alley! I love this kind of meal for dinner. Yum – going to make this next week. well this looks super easy to make. Sounds like it could be the perfect summer meal. This looks so good! It’s such a simple meal, but looks so fresh and delicious. Yum! This looks amazing! I love frise, but never actually use it at home – I only get it out. But, I might have to look for some and then make this. Oh mylanta! I need this in my life right now. That looks absolutely amazing! Totally worth trying to poach an egg again! I love breakfast salads. Minus the bacon I want this for breakfast. Too bad I have to go to work instead. this looks Delicious- but I can not cook a poached egg to save my life. I have been trying for years and FAIL every time! I Crack the egg into measuring cup, then use the spoon to swirl the water before dropping it in. I slightly stir the water to not leg egg sit on bottom for 10 seconds. Then set the timer for 3 minutes. It works EVERY. SINGLE. TIME. Try it and let me know if it works…. I love frise lettuce. It really does hold its crunch, while clinging on to the delicious dressing. 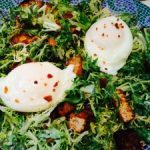 I’ve never thought about using a poached egg on a salad, but after seeing this recipe I definitely want to try it out. This looks amazing! It has such a fresh but filling look about it! We are going to have to try this soon! This is one of my favorite breakfasts! Protein and veggies to start my day- yes please! Can’t wait to try your vinaigrette recipe! I am going to keep your basic vinigarette dressing recipe. I love mustard and red wine vinegar together. Thanks for sharing. That looks really tasty. I have never used frise in a salad, but I think I am going to start. Change it up a little! 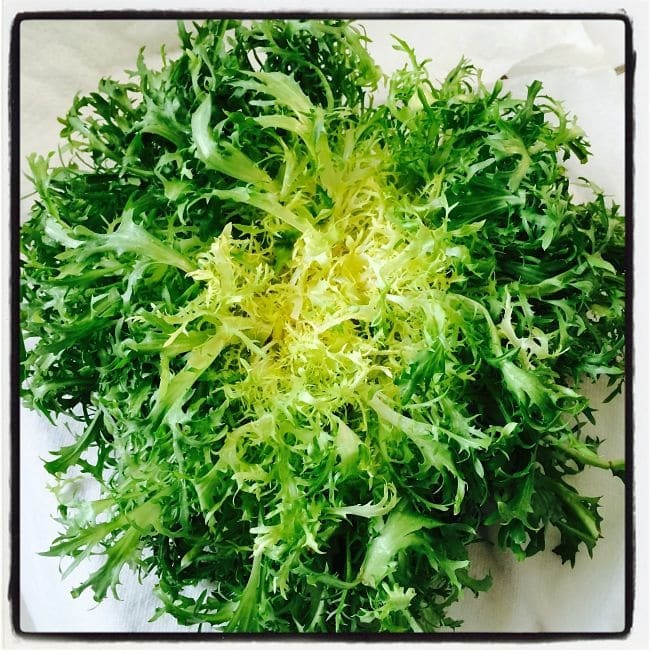 I love frise lettuce too it is so much better than argula in my opinion ! I would love to make a veggie version, maybe add some quorn bacon instead? That looks delicious and I’m not really a frise person. Too peppery for me. I love the presentation of this salad. I’m not a fan of pouched eggs but would certainly enjoy the rest of this beautiful meal. This is my favorite brunch meal! I need to make it for my mom! She loves poached eggs. This looks awesome! I have never thought to put a poached egg on my salad, I always go hard boiled! I love all the different lettuces you can get now. Your salad looks amazing, my kind of dinner! I’m pretty sure I could live in the produce section at Whole Foods. lol I’ve seen frise’ before, but I don’t think I’ve ever tried it. I definitely can’t stand arugula, but I could probably handle this. I’m certainly willing to try it. Salads during the warm weather season are the perfect meal! I’ll definitely need to try this one. You had me at bacon 😉 This sounds seriously delicious! I am going to have to make one soon! Isn’t it funny how we can see things and never try them? There are lots of vegetables like that… I need to work on trying new things too! Made this last night. So simple and my whole family loved it. 🙂 Thanks! !